Instagram Contest! Follow Us @Dubspot to Win a Free Course! Instagram Contest! Follow Us @Dubspot to Win a Free Course! Instagram Contest! Follow Us @Dubspot to Win a Free Course! Instagram Contest! 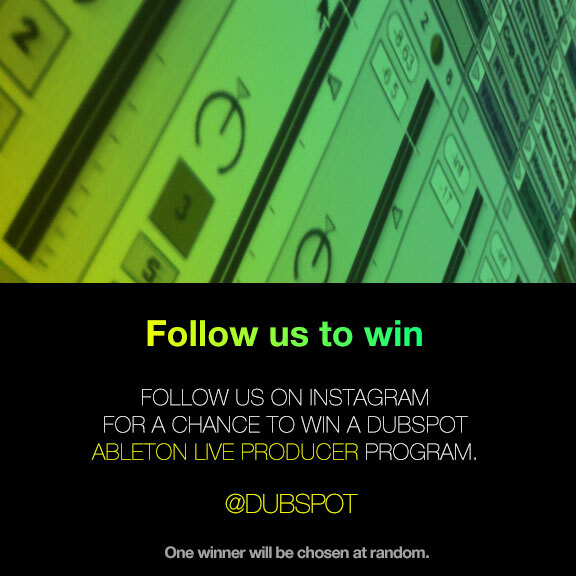 Follow @Dubspot on Instagram to enter to win a free Dubspot Ableton Live Producer Program. One winner will be chosen at random from all of our followers, so if you’re already a part of our Instagram community, don’t worry about re-following. Follow @Dubspot on Instagram for a chance to win an Ableton Live Producer Program! Keep up with everything Dubspot on Instagram. Catch behind the scenes photos of shows, workshops, events, and classes at Dubspot NY and LA. We also post pictures of gear, studios, inspiring workspaces, and the well-known producers that stop by our campuses as well. We will be choosing one winner at random from all of our followers so don’t get left out!